Fresno County is extremely hot in the summer, so we all need shade. Mico construction would like to give you a free consultant on how you can build different types of patios. Below are some design ideas that you can learn more about patio covers so you can protect your patio and fully enjoy it. The patio cover is a good investment to protect anything that needs shade. It can help to block sunlight and give you a nice decoration to the protected area. Covered porches are also very popular in giving a homeowner the freedom to enjoy the beauty of the outdoors. There are a lot of patio design ideas that you can research before building it. Mico construction has many good designs and ideas about patio cover that you can choose including lattice patio, awnings etc. Give us a call for a free consultant, and you find a lot of useful information about patio material, construction, size, design, styles, sample gallery of different type of patio covers. Hope you will choose a nice cover for your patio that fit your home style and increase the value of your home. The patio is usually built in the backyard on your deck so that you can have some privacy for it. This article is not to guarantee anything but in purpose to help you choose a proper patio cover that would fulfill your needs. The patio cover has many purposes. It usually uses for recreation or dining and it is often paved. Beside, patios are also paved with stone slabs or concrete. It also can be constructed using tiles, bricks, or cobbles. It basically has two column or posts that used to support the outer most part of the patio cover. 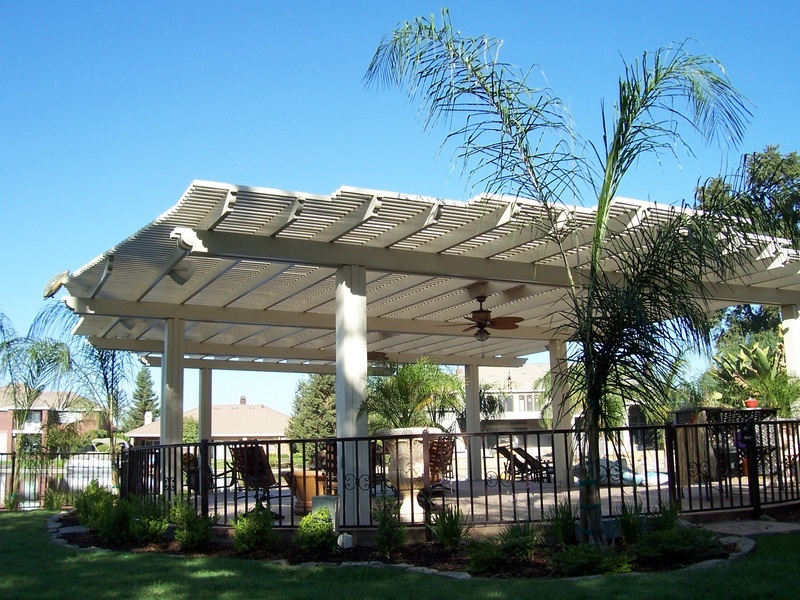 It could be an open roof or covered roof depending on what do you plan to do with your patio cover. It is best to have a solid roof for it in case there is raining. Similar to sunroom designs and gazebos, aluminum covers will just be similar to any other solid roof structure. It depends on how big is your home and how much shade that you want to protect. You need to make sure that your patio cover is big enough to cover the original patio or anything that you want to cover and try not to build it too high up above. Wherever there is most rain and sun that needs covering, you want to place your patio cover. Many people have an idea about placing their patio cover right closed to their back door and it serves as an extension that gives them some extra spaces to the backyard. The most important part that you need to know about the patio cover design is that it is solely for shading and protection the patio so there is no need to spent too much on it. Before moving forward with your patio cover ideas you can consult a construction company to learn more about it and how to build your patio cover correctly in term of amount of shading or how height it should be. Both of the ideas have its own advantages. But keep in mind that, protection is the top priority in making a patio cover. As for the open roof, which is not able to protect the patio well on snow or rain and it lets light come through creating a beautiful pattern of shades. The solid roof cover would be much more protected when there is raining and snowing. This type of patio design usually uses aluminum as a material. Wood patio roof is also a good option to think about but it is not lasting very long. A lot of homeowners would also use shingles to construct their patio cover to match the style of their home. All these ideas are not guaranteed by Mico but to give you an idea and options that help you choose a nice patio cover that it will enhance your experiences in the living outdoor.